Having an Idli/ Dosai batter in the refrigerator is always a comfort feeling for all of us. 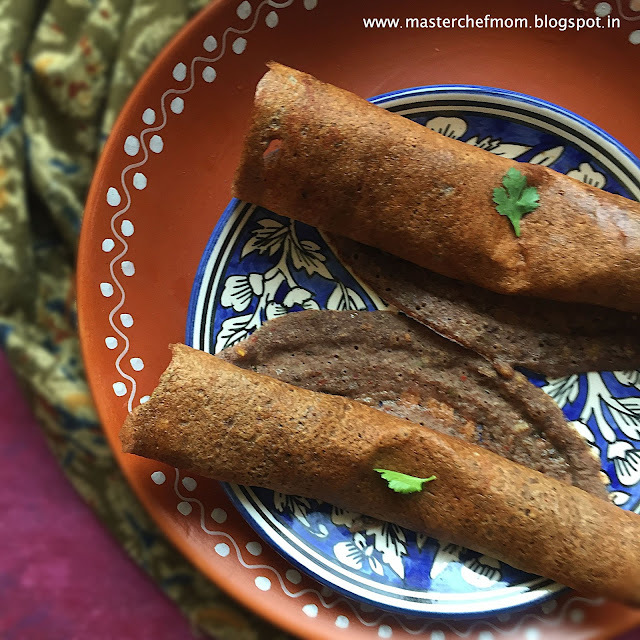 This weekend, I made a tasty and wholesome dosai using mixed dals and ragi flour. I had shared the ‘making’ in my instagram feed and I received so many requests to share the detailed recipe . Thank you for being so appreciative and encouraging. I am so grateful for all your love. I completely enjoy sharing my recipes with you all. 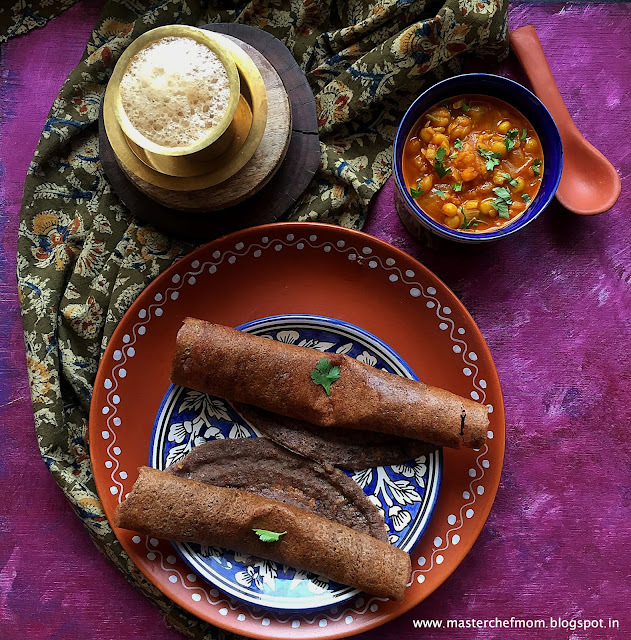 Finger Millet or ‘Ragi’ , as we popularly call in India is rich in fibre and is packed with calcium and Vitamin D. I have already shared Instant Ragi Dosai Recipe and Ragi Dosai recipe ( fermented version) with you all. This is the third variation. In Gurgaon, I get ready made mixed dals which has toor dal, channa dal, green moong dal, split black gram dal. You can add equal amounts of these to make this dosai. The dosai was a big hit in my home and trust me, no one likes ragi so much . But, they loved this dosai as it was so tasty. 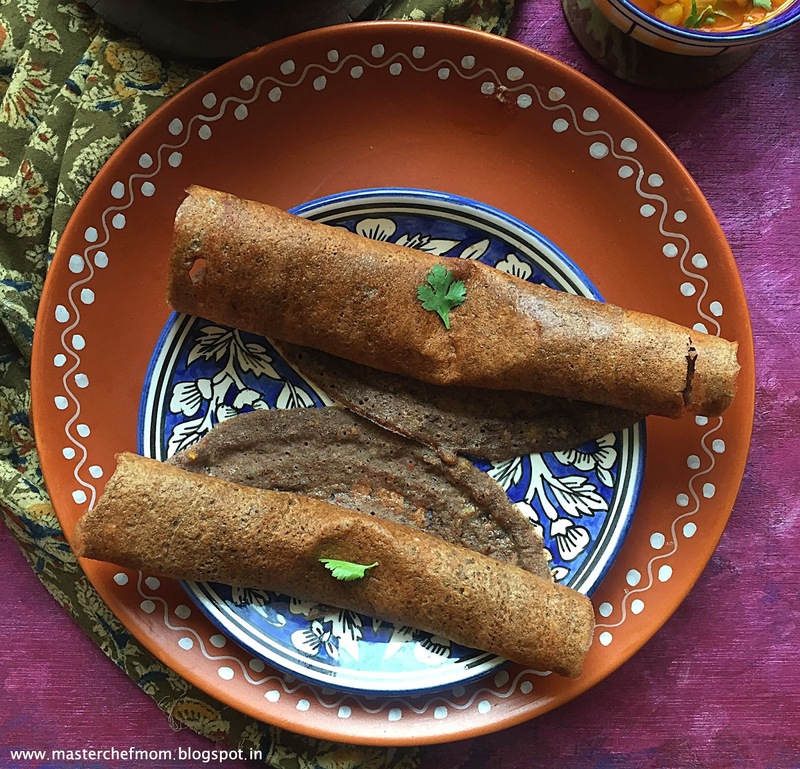 This dosai is gluten free , wholesome and so easy to make . 1. Wash and soak dals along with dry red chillies for four hours . 2. Grind them smoothly in batches using 1 cup of water. Chef tip: I like to grind the batter thick and dilute as and when I am making the dosai. 3. To the ground dal mixture, add ragi flour, salt, asafoetida and curry leaves ( if you are adding )and mix well using your hand . Chef tip : You can add 1 cup of water and make a loose batter. 4. Allow the batter to rest for 5-6 hours. Note : The batter does not require fermenting and can be used immediately. But the taste and texture of the dosai gets even better after resting. In fact , you can rest the batter in the refrigerator overnight , dilute the batter and make dosai next day. Tastes great. 5. Your Ragi paruppu dosai batter is now ready. You can refrigerate and use the batter upto 3-4 days. 6. Before making dosai, take small portion of the batter ( 2 cups ) in another vessel, dilute the batter using 1 cup water , mix well and start making dosai. Important note : The batter should be in room temperature to get that perfect colour and texture. 7. Now you can start making Ragi paruppu dosai like regular dosai . You can refer here for stepwise pictures. I served the Ragi Paruppu dosai with Yellow Peas Curry ( Matar) . It was a delicious combination. You can refer to my yellow peas curry recipe here. The only variation I made in the yellow matar recipe is that I used tomato puree instead of chopped tomatoes . Loved, the colour and the taste. Do try ! You can add curry leaves either in the batter while grinding or can tear and add them to the batter . You can also sprinkle grated vegetables of your choice after spreading the dosai . Press lightly with the spatula and then flip and cook .